Special education (speech-language pathologist) have 24 specialists. 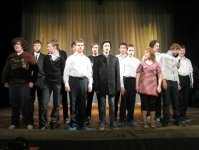 265 pupils study at school № 5 in age from 7 to 17. Secondary school - 5 - 10 forms. School-leaver get state certificate attained for passing school-leaving examinations. Who study in our school? - Language disorders (difficulty understating what they hear as well as expressing themselves with word). - Cognitive - communication disorders (difficulty with thinking skills including perception, memory, judgment, intellect and imagination). - Shuttering (fluency ) disorders (interruption of the flow of speech that may include hesitations, repetitions, prolongations of sounds of words). - Voice disorders (quality of voice). Teaching collective use special technologies of teaching. Our teachers considerate individual particulars of each child. Screening, assessment and treatment of communication problems involve cooperative efforts with: - parents, speech-language pathologists, psychologists, social workers, classroom teachers, nurses. There are special conditions for comfortable teaching in our school: 10-12 pupils in each class, roomy gym, library, office of psychologists, office of nurse, computer's classroom, dining-room. Education, school eating, training in swimming-pool are free. "Speech development of children by means of art". Social adaptation of children by means of practical experiences in educational process". " Teaching and psychological conditions for professional choice of teenagers". We invite other schools to cooperate with us. We have an interest in the teaching and social adaptation of children with speech and language disorders. We will be glad to get new experience and methods in these directions".